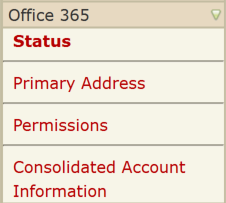 By default, all Service Accounts are hidden from the Office 365 Global Address List (GAL). This document explains how to manage the visibility of Service Accounts only. For information on how to manage your NetID account search status, review the following docs: Students | Faculty/Staff. The UW-Madison Office 365 team can only guarantee that a hidden account will be hidden within Outlook on the web and latest versions of Outlook desktop clients. If you are viewing this page for a NetID account, there will not be an option to hide/show the account. NetID accounts cannot change their status within the Global Address List (GAL). See Office 365 - Getting Started with the Global Address List (GAL) for more details on GAL visibility for all account types. If you are linked (have full mailbox permissions) to a Service Account and cannot interact with the account using Outlook for Windows (via automapping), please make sure the service account is visible in the GAL. Important: Only domain admins and authorized admins are able to make this change. If you are only linked to the account, you will not be able to make this change. Click Show from GAL button. It may take up to 15 minutes for your account to be searchable from the GAL. Select the account you want to manage. . If you do not see the account you want to manage or are placed into your NetID account, review the following document: Wisc Account Administration site - Logging in. Click Hide from GAL button. It may take up to 15 minutes for your account to be unsearchable from the GAL. Remember: Even when the account is unsearchable, it can still receive emails and event invitations.